Register for Summer School, Apply for Summer Internships, Enrichment Programs and More! 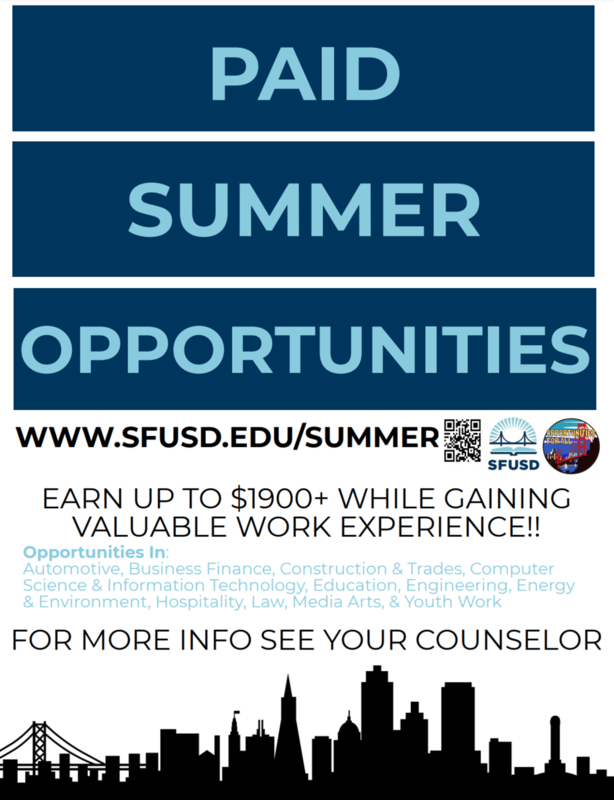 Families: SFUSD and City College of San Francisco are offering many opportunities for SFUSD students to earn credits (HS and college), earn money, and gain valuable experience! Does your student need to make up or take classes to graduate high school? Summer credit recovery courses for 9-12th graders will run from June 12, 2019 - July 18, 2019 and will be offered at Mission HS, Balboa HS, and Lincoln HS. Students should see their counselor to sign up, or can sign up in person during the first 3 days of classes. There is also a Senior Summer Graduation School being offered to seniors only which will run the same dates at Galileo HS. The Transitional Studies Department of CCSF offers credit recovery options for high-school students free of charge. Courses are available in the subject areas of math, English, science, and history, as well as courses for English Language Learners. For a complete list of classes go to: www.ccsf.edu/creditrecovery. More information about summer credit recovery options and a sign-up form is available at the SFUSD Summer website. There are also credit recovery options available during the school year. See more options here. Is your student interested in opportunities to get college credit over the summer? SFUSD Early College/ CCSF Dual Enrollment gives students an opportunity to earn college credit through a partnership with City College of San Francisco (CCSF). Some courses, such as offerings in the field of Health, allow students to receive SFUSD credit as well as college credits. There is even an opportunity to become certified as an EMT! This year the program will be offering a selection of courses in the following fields: Ethnic Studies, College Success, Latin Culture, Administrative Justice, Design Media, Biotechnology, Child Development, Internet Basics, Fire Science, Intro to Business, Health, Real Estate, Photoshop, and Visual Media Design. Learn more about this program at the SFUSD Summer site, or by visiting the Dual Enrollment page on the CCSF website. Online enrollment for summer starts May 6, 2019 and summer classes begin June 10, 2019. Is your student interested in gaining work experience, possibly earning credits, AND making some money this summer? SFUSD offers many opportunities for paid internships, may also offering a chance to earn college or high school credit. Internships are available for students ages 15 and up and include opportunities to work with children, work in gardens, and in heath services fields. More details about eligibility and how to apply can be found here and here. SFUSD’s site also has a very comprehensive guide to summer internships for high school students in the bay area. Many of the deadlines have passed, but some have not or are rolling. Check out the list here. Would your student benefit from opportunities to improve English Language skills? 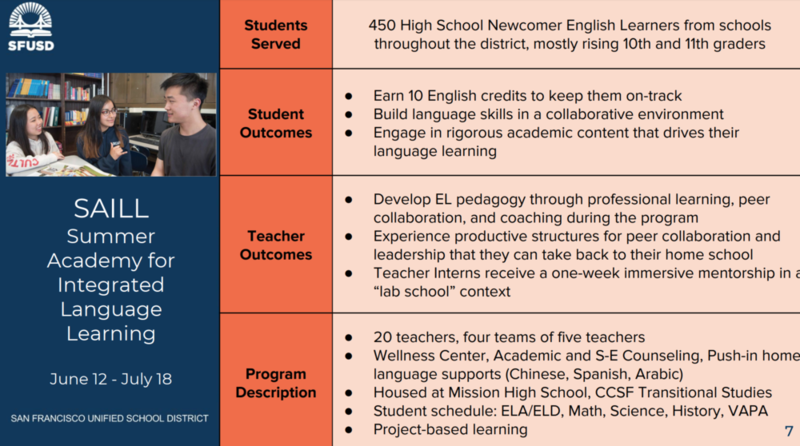 The Summer Academy for Integrated Language Learning (SAILL) will be offered at Mission HS from June 12, to July 18 and can serve up to 450 high school students who are newcomers to this country and English Learners. The program allow student to earn 10 English credits, learn language skills and participate in rigorous project-based academics, while also receiving access to wellness services, family language supports and visual and performing arts. For more information students should contact their counselors. Other Summer Programs! Early education, middle school visual and performing arts, AVID programs, extended school year for students with IEPs and more! 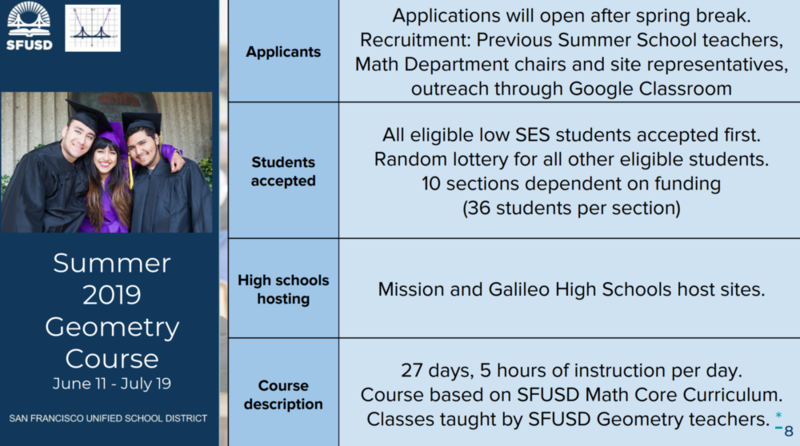 We have highlighted some of the summer options offered by our housed within SFUSD. There are many more! Below is a summary of programs. If you are interested in learning more, reach out to your student’s teacher or counselor for more information. Happy summer!